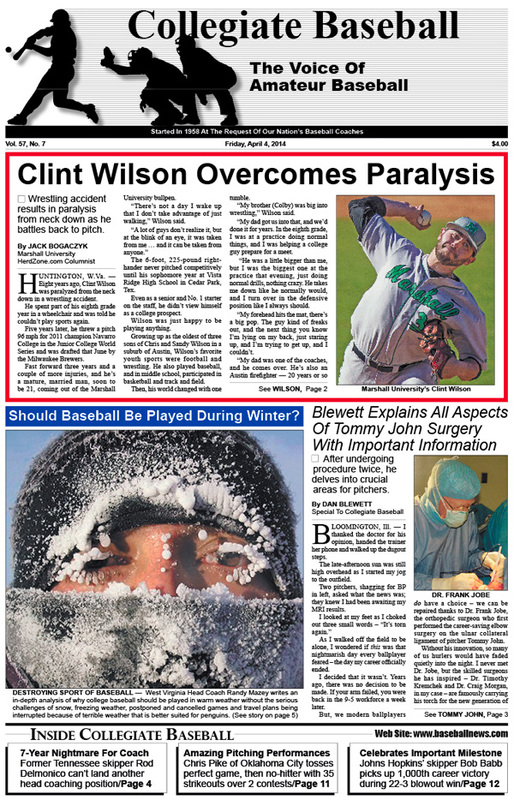 • Clint Wilson of Marshall University suffers paralysis from the neck down after wrestling accident and comes back to eventually play baseball. • Should baseball be played during winter? West Virginia Head Coach Randy Mazey writes in-depth analysis of why college baseball should be played in warm weather. • Dan Blewett explains all aspects of Tommy John surgery and gives sage advice after undergoing procedure twice. • Editorial: It’s time to make head protection mandatory for pitchers in baseball games. • Lou Pavlovich column: Is age discrimination taking place now in game? • Charlie Greene: Well thought out practice for pitchers pays off big. • NCAA Division I Notes: Nevada-Hawaii contest features rare statistics which includes only 1 batter over minimum, 0 combined runners left on base. • Louisville Slugger National Players of The Week. • High School Notes: Rundown of top high school tournaments across USA. • H.S. National Top 30: Harvard-Westlake (Studio City, Calif.) ranked No. 1 with 8-0 record. • NAIA Notes: Oklahoma City RHP Chris Pike follows perfect game with no-hitter. Doesn’t allow a hit over 17 innings. • NCAA Division 3 Notes: Johns Hopkins Coach Bob Babb becomes 9th NCAA Division 3 coach to reach 1,000 wins. • NCAA Division 2 Notes: Tampa’s Giovanny Alfonzo hits inside-the-park home run. • Caltech posts win after 47 straight losses. • Ruleball with Rich Marazzi: Deflected ball situations are discussed in detail. • Geoff Zahn explains how to upset hitters’ timing with key techniques..
To order the April 4, 2014 edition of Collegiate Baseball or subscribe, CLICK HERE.